Hi, friends! I’m here today teaming up with my friend Elyse from Proud to be Primary for a little bit of teacher talk regarding alphabet instruction. Let’s be honest… letter and sound retention can be a struggle for some of our little learners. Some of them need repeated practice to make those letters and sounds stick! You can grab a copy of this letter chart by clicking HERE or on the picture below! By the end of the second week, we have learned all of the mnemonics for each letter. This does not mean we are finished with the letter chart. We continue to run through the entire alphabet a few times a day. We use the letter chart to rhyme through the alphabet. This means I choose a word to rhyme with, and we make a rhyme for each letter of the alphabet (excluding the vowels and letter x)… so if I chose the word “man,” I would point to Bb and say /b/, /b/, ban; then, point to Cc and say /c/, /c/ can; then, point to Dd and say /d/, /d/ Dan; and so on. I have to take a time out to thank my teammate for the idea for this awesome alphabet chart and the accompanying hand motions! She is truly genius! The students keep a copy of this letter chart inside their writing folders. I also keep a drawer of these back at my small group table to use with my letter/sound strategy groups. We begin by using this chart to warm up our brains. Sometimes, I call out a random letter and the students have to finish with the rest of the words and the hand motion. Other times, I might say “cover the letter that says /m/,” “find the letter that comes before c,” “point to the letter after d,” etc. I introduce the letters in the sequence outlined in Recipe for Reading by Francis Bloom and Nina Traub. Typically, we cover three letters per week. On the first day, I introduce the letter and we look at the items inside the letter box. Prior to introducing the letter, I choose a student to take home the letter box. I slip a little note inside the box, so the parents know exactly what to do once they get the box. Each student finds 3-5 items beginning with the focus letter to share with the class. You can read more about my letter box here. After looking at all of the items inside the letter box, we practice writing the letter in the sky with our index finger. I like to play the Hooked on Phonics path of motion videos, which you can find on YouTube. Just type in “hooked on phonic (letter you need)” into the search bar. We practice writing the letter with our index finger a few times, making sure to recite the language for the correct path of motion. Then, we take out the white boards and continue practicing the correct path of motion for that letter. Here is the video for the letter M.
On the second day, we review the letter. This is accomplished a number of ways… sometimes we complete an alphabet craft, such as this little cat made from the letter C.
During small group instruction, we dig deeper into letter/sound recognition. We always begin with reciting the alphabet chart. Then, we practice forming the letter. My kiddos love to write the letter in salt/sand. I simply filled a pencil box with some decorative sand from Michaels. You could also use regular table salt. As the students are forming the letter, I have them say the language for the correct path of motion. This is a great tactile approach to letter instruction. Speaking of tactile approaches, my kiddos also enjoy using these alphabet rubbing plates from Lakeshore Learning. I like to tape the plate to the back of the paper to prevent slipping. As the students are creating their alphabet rub, I have them say the name of the letter and the object(s) that begins with that letter… so “Z is for /z/, /z/ zipper.” Sometimes, we will touch the rubbing plate with our finger and trace along the letter while saying this. One of our favorite games to play is KABOOM! This game is so simple to make. Just jot a letter on the end of each popsicle stick. Then, on a few random sticks write the word “KABOOM!” To play, a student will pull a stick from the cup. If he/she correctly identifies the letter or sound, he/she gets to keep the stick. If not, the stick is placed back inside the cup. If the KABOOM! stick is drawn, that child puts back all of his/her sticks. The idea for this fun game came from the amazing Jillian of Starr Spangled Planner! Let’s just take a moment to remember the range of academic needs in our classrooms… we all have those high flyers, average Joe’s, and those sweet kiddos who know very few letters and sounds. Because of this range, it’s important for me to differentiate instruction during our small group time, especially since we need to kick it into high gear as we move from emerging readers to independent readers. The rest of the activities in this post are perfect for easy differentiation! One differentiated activity I like to use in the beginning stages of letter/sound recognition are alphabet puzzles. My lower group works on matching the uppercase and lowercase letters; while my middle group(s) work on matching the uppercase and lowercase letters, as well as a picture beginning with that sound. My high group matches four pieces (uppercase letter, lowercase letter, and two pictures beginning with that sound). Some days, we use our Alphabet Clip Cards to identify letters. Some of my groups work on marking uppercase or lowercase letters. Others work on matching upper and lower case letters. My highest group works on identifying beginning sounds for each letter. We also like to use bingo daubers during small group instruction. Spot It! Dot It! is a quick activity that my kiddos can complete independently while I am working with one or two students in the group. First they dot the letter, reciting the correct path of motion. Then, they trace the letter with the correct path of motion. Last, they spot the letter and dot it with the bingo dauber. Once I have introduced a set of letters, we practice our letter fluency using this Roll and Read activity. The kiddos roll the die and quickly read the letters in that row. My lowest group focuses on uppercase letter recognition, while my middle group focuses on lowercase letter recognition. My highest group uses mixed upper and lowercase Roll and Read boards. I may even have them name the sound. The goal of this activity is to make letter recognition automatic. As we become better at identifying letters/sounds, we play Alphabet Dominoes. Some kiddos work on just matching the letters, while others work on matching upper and lowercase letters. We even match letters to pictures, as we are working on identifying beginning sounds. You can grab each of these differentiated games and more in our Reaching Readers Differentiated Alphabet Games Unit 1! Reaching Readers is a program designed to help teachers with their small group, guided reading instruction. Each unit in this program will contain lesson plans, small group games, assessments, paired texts, fluency activities, and more. Each portion of the each unit will be released separately as they are completed. There will be 6 units in total for the Reaching Readers program. In Reaching Readers Unit 1 Differentiated Alphabet Games, you will receive 9 different games for your guided reading small group instruction. This unit covers all the letters in the alphabet and helps build phonemic awareness. Students will build their upper & lower case letter identification skills and letter sound to picture knowledge. What makes Reaching Readers so special? Every component of this program is DIFFERENTIATED! Each of the 9 games included comes with 3 differentiated levels. This means you will have the same activities/materials for your different leveled groups, but it will be at their level! Plus, you can grab a sample of each of the games below! If you’re looking for more great alphabet ideas, you can check out my Alphabet board on Pinterest! Follow One Sharp Bunch’s board Alphabet Activities on Pinterest. 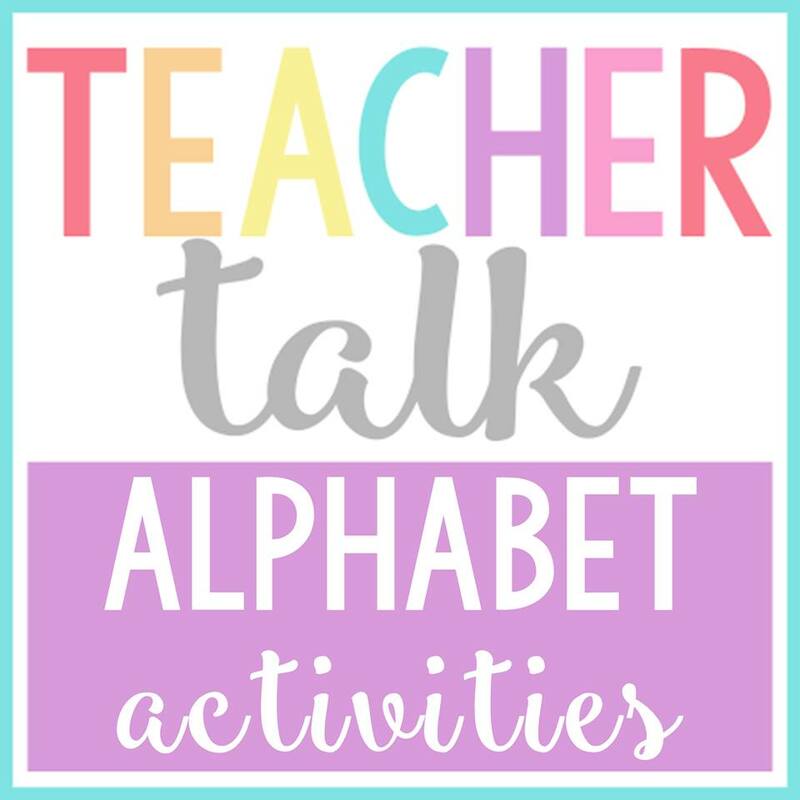 Don’t forget to head over to Proud to be Primary to check out all of her small group ideas for alphabet instruction! Thank you for tuning into this edition of Teacher Talk!